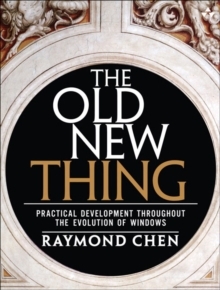 "Raymond Chen is the original raconteur of Windows." --Scott Hanselman, ComputerZen.com"Raymond has been at Microsoft for many years and has seen many nuances of Windows that others could only ever hope to get a glimpse of. With this book, Raymond shares his knowledge, experience, and anecdotal stories, allowing all of us to get a better understanding of the operating system that affects millions of people every day. This book has something for everyone, is a casual read, and I highly recommend it!" --Jeffrey Richter, Author/Consultant, Cofounder of Wintellect "Very interesting read. Raymond tells the inside story of why Windows is the way it is." --Eric Gunnerson, Program Manager, Microsoft Corporation"Absolutely essential reading for understanding the history of Windows, its intricacies and quirks, and why they came about." --Matt Pietrek, MSDN Magazine's Under the Hood Columnist"Raymond Chen has become something of a legend in the software industry, and in this book you'll discover why. From his high-level reminiscences on the design of the Windows Start button to his low-level discussions of GlobalAlloc that only your inner-geek could love, The Old New Thing is a captivating collection of anecdotes that will help you to truly appreciate the difficulty inherent in designing and writing quality software." --Stephen Toub, Technical Editor, MSDN MagazineWhy does Windows work the way it does? Why is Shut Down on the Start menu? (And why is there a Start button, anyway?) How can I tap into the dialog loop? Why does the GetWindowText function behave so strangely? Why are registry files called "hives"?Many of Windows' quirks have perfectly logical explanations, rooted in history. Understand them, and you'll be more productive and a lot less frustrated. Raymond Chen--who's spent more than a decade on Microsoft's Windows development team--reveals the "hidden Windows" you need to know. Chen's engaging style, deep insight, and thoughtful humor have made him one of the world's premier technology bloggers.